The Philadelphia Catholic League was heavily represented on the 2018 PIAA all-state football team as chosen by Pennsylvania’s high school sports writers. All told, 12 different athletes from five different PCL schools were honored. Not surprisingly, St. Joseph’s Prep dominated with six players. While winning the Class 6A state title and finishing with a perfect 13-0 record, the Hawks finished the season ranked eighth in the country. Prep quarterback Kyle McCord was named the Class 6A state player of the year. The sophomore phenom engineered one of the finest seasons in PCL history with 201 completions in 302 attempts for 2,883 yards and 35 touchdowns. McCord threw multiple touchdowns in 12 games and one TD in the other. McCord saved his best for the postseason, during which he fired 18 touchdowns in six games. Two of McCord’s receivers — senior Johnny Freeman (51 catches for 847 yards and 11 touchdowns) and sophomore Marvin Harrison Jr. (50-724-8) — were also named on offense, as was all-purpose senior Marques Mason (1,129 combined rushing and receiving yards and a team-leading 18 total touchdowns — 11 rushes, four receptions, two kickoffs, and one punt). 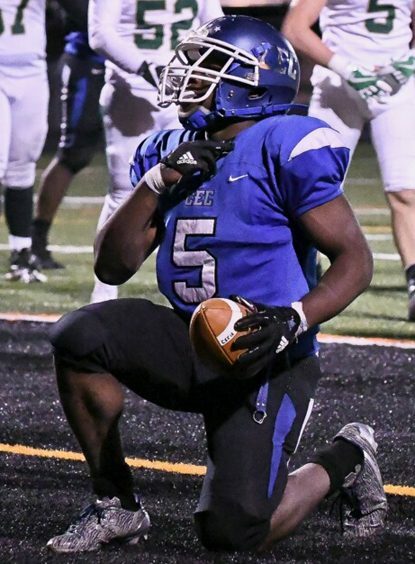 On defense, Prep senior linebacker Myles Talley and sophomore linebacker Jeremiah Trotter Jr. benefitted from a combined starring role (24 tackles, 15 of them solos) in the Prep’s 40-20 state championship victory over Harrisburg – the Hawks’ fourth in six seasons. “I found out through my parents,” said Talley. “They had been looking through all kinds of articles and websites to find any information that they could. I don’t remember what day it was, but I was in the living room with my mom, and my brothers and I were startled by the shout of my mother congratulating me! For the Class 3A squad, Conwell-Egan senior Patrick Garwo was a no-brainer. The Boston College University-bound running back set numerous school records for both one season and a career while propelling the Eagles to a 13-1 record this year. This past fall, Garwo collected 2,027 yards and 30 touchdowns rushing and added 291 receiving yards and five scores. For good measure, Garwo also returned a kickoff to the end zone. His eye-popping career numbers — 5,064 rushing yards, 82 composite touchdowns — were off the charts. Joining Garwo was his Conwell-Egan teammate Dwayne Majors, a two-way senior lineman who was chosen on defense. Majors, who announced recently that he would attend St. Francis of Loretto (Pa.) and play defensive tackle and defensive end, heard the news from one of his new coaches. Neumann-Goretti sophomore Tysheem Johnson made the team as a defensive back. Although his N-G highlights were mostly of the offensive variety (six rushing TDs and seven receiving), Johnson snared one interception and returned it for a touchdown while usually blanketing the opponent’s top receiver. He also scored on a kickoff return. “I was very excited,” said Johnson. “I found out from my coach the first day it was put out. It told me that all the hard work wasn’t for nothing. Now my goal is to win MVP of the Blue Division. 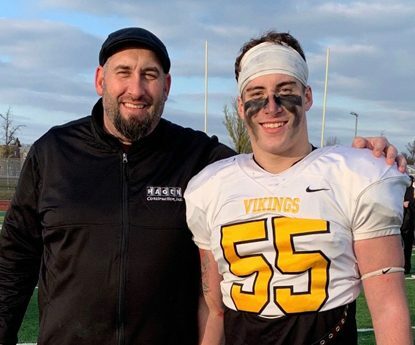 Archbishop Wood senior Connor Bishop was one of three standouts named to the Class 5A squad after contributing 10 sacks, 50 total tackles, and a fumble recovery. 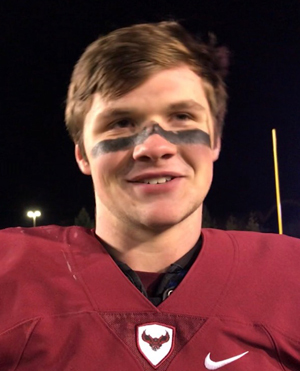 The others were Wood senior linebacker Dylan Urbanowski (104 combined tackles, four forced fumbles, two fumble recoveries, and two sacks) and Archbishop Ryan senior kicker Gavin Dionisio (44 extra points and seven field goals; he also tossed a 29-yard touchdown on a trick play). Urbanowski, who remains undecided, said he felt humbled.